The Acorn Controls Command Station™ is a self contained tempering and recirculating system. Every system is factory assembled to a welded heavy duty mounting frame for simplified installation. 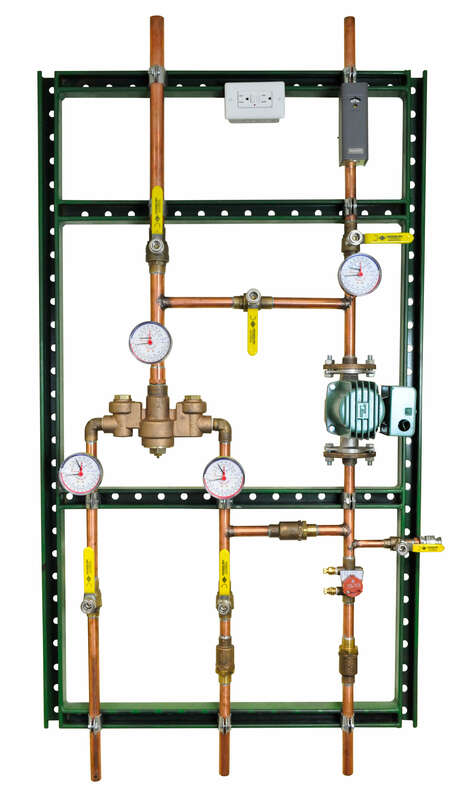 The Acorn Command Stations are 100% factory tested and utilize the MV17 valve (or valves) which are IAPMO certified, at the published minimum flow, to exceed the performance requirements set forth in the ASSE 1017 standard. Acorn Controls Command Stations are designed to reduce the potential for improper piping, missed connections and/or failing to include key system control components that are common with contractor “design-as-you-build” types of installation. Acorn Controls Command Stations have a much smaller footprint and minimize material waste on site. For any future troubleshooting that may become necessary, a Command Station ensures you have quick and easy access to all key components needed for the process. Lead Free solid brass body with corrosion resistant and lead free internal components. The wetted surface of these valves contacted by consumable water contains less than 0.25% of lead by weight in conformance with national lead free law. Integral checks with screens to prevent backflow and to filter debris from entering the valve. Temperature adjustment is made using an allen wrench. A locknut on the bonnet prevents unauthorized or accidental temperature adjustment. Commercial quality thermal actuator provides repeatable, reliable performance. Includes lockable brass ball valves. Factory assembled to a heavy duty, welded uni-strut for quick and easy installation. Assembly is pneumatically tested as a complete unit to 80 psi (556 kpa). A GFI receptacle for electrical components. The MV17 is capable of exceeding the temperature control accuracy requirements of ASSE 1017 at Zero GPM actual user demand. The system must include a continuously operating recirculation pump capable of meeting the minimum flow rate shown on the nearby chart (0.5 to 4 GPM based on the model) with a correctly adjusted balancing valve.